Select the Segments option from the List Menu dropdown. This will display all of your current segments. Next, click on the button Create New Segment . This will open the New Segment Window. The first step is to select the segment source. 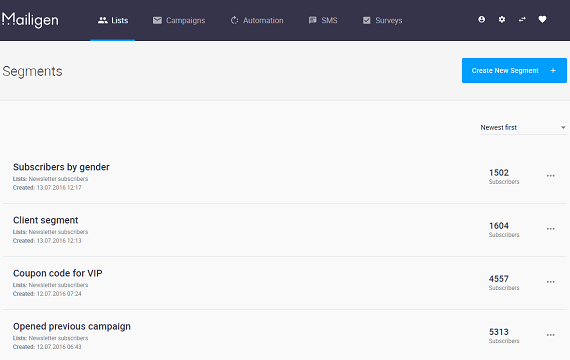 You can create a segment either from a list or from an email campaign. Choosing either option will list all options from which you can select the segment sources by checking the appropriate boxes or radio buttons. NOTE: When creating a segment from a list, you can select more than one list. 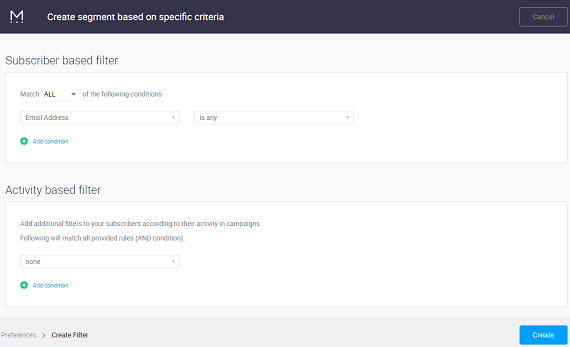 When you create a segment from a campaign, you can select only one campaign. Once you have specified where the segment should originate, give your segment a name in the Segment Title field (required). Click the button Next to continue. This will open the Segment Filter Window. In order to create a segment, you need to filter the subscribers from the sources that you selected. This is accomplished through The Segment Filter Window. There are two types of filters you can use—Subscriber-based and Activity based. Match Type (required)—use the drop down to select how the filter should match the criteria. You can either select to use “AND” (in which the results of the filter need to match all criteria selected) or “OR” (in which the results of the filter need to match one or more of the criteria selected). Filter Subscribers Where (required)—this is where you specify the criteria against which to filter. The first drop-down is the data point against which to filter. Options include data points from the subscriber's record like email, first name, last name, date opted-in, etc. NOTE: All fields from the selected source lists or campaigns will appear in the drop down enabling you to filter against any data point list. The second drop-down specifies how the criteria should be matched. For example, “is,” “contains,” and “starts with”, etc. The final field is dependent upon what you selected in the first drop-down. For example, if you have selected email address, this will be a text field. If you selected “opt-in method” this will be a drop-down from which you can select an opt-in method. You can add more than one filter criteria or remove a filter by clicking on the + add or - remove button at the end of the filter row. When you are finished, click the button Save to create the new segment. For the activity-based filter, the options are dependent upon the type of activity you select in the drop-down as well as the segment source. For example, if you are building a segment from lists and select “opened” from the drop-down, you will need to specify additional criteria such as Date Range, and a range for Open Date Start and Open Date End. If you chose to create segment out of Campaign, a date range will not appear. 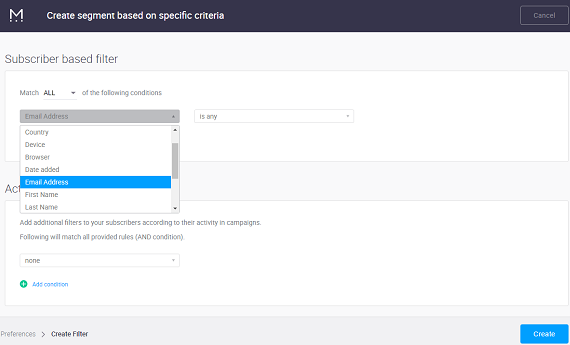 Alternatively, if you are building a segment from a campaign and select “clicked” you can specify links which the user has clicked on. Like the subscriber-based filter, you can add more filters by clicking on the + add or - remove button at the end of the filter row. After you have created and saved your segment, you can export the segment to a Microsoft Excel spreadsheet. Select the Segments option from the Lists Menu. This will display all of your current segments. Next, click on the segment you just created. Finally, click on the Export Segment Link. This will download the segment contacts as a Microsoft Excel (xls) formatted file.